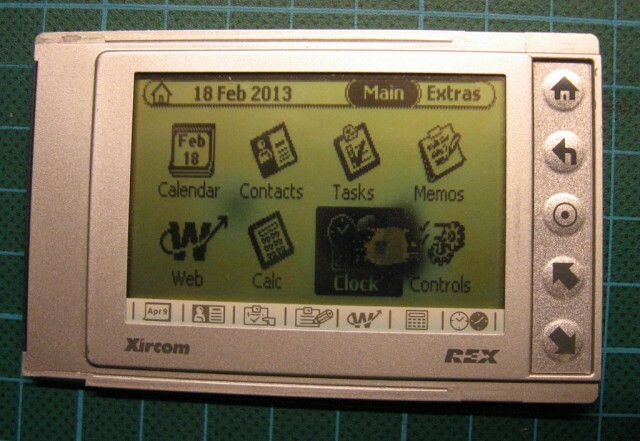 Somewhere in 2001 year I was hooked by small PDA with touch screen: Xircom REX 6000. And then Intel appeared, seized Xircom and announced that best feature of REX 6000, rex.net portal will be shut down in month or two. It was also very handy that sync application (only for Windows) had url of sync site stored in Windows registry, so replacing it was very easy. It was my first ‘community’ project:-) Because I was unable to deliver similar data to original rex.net site, I decided to allow portal users to define urls for grabbing content. With some basic filtering (skipping not important parts of text, strip and interpret html tags) everyone could prepare ‘tailor made’ dynamic content (updated twice a day). There was also possibility to define ‘static’ content, so everyone could prepare ‘pages’ with e-books, manuals and so on. And of course, every content could be private, public or shared only with specific list of other users – and most of it were public. As for today, more than 4000 custom ‘pages’ was created on this site by more than 3000 users from all of the world, most of it in first two years of running this site. In Facebook era this numbers are not impressive, but these days it was quite a lot. Right now, after about 12 years of providing uninterrupted service, it’s time to end this chapter. I run it as long as someone was using it and as long as my very old software worked without modification. But last year there were only 3 people logged in (two were syncing REX!). I’m also in the middle of migration of services from old server to new one, and after migration there is almost impossible that 12 years old compiled cgi (using libraries for Mysql 3.x) still will work. So, this is end of rex.mamy.to, sorry. I had some notes stored there. Could you send all my uploaded content to me? My username was bpo561. If you need my password, contact me. Majek, I happened to stumble upon this post today when an old bookmark to rex.mamy.to caught my eye. I stopped using my Rexes several years ago, but your site was a godsend for avid Rex fans, and it kept my Rex going for several years longer than I expected. To see now that you actually kept it running for several more years after I retired my Rex is impressive. The Rex user community is much in your debt for the great service you offered. A sincere thanks, and a hearty cheers all round for your great work over the years. Thank you Philip. I appreciate your cheerful words and of course also your donation (wow, it passed almost 8 years since then). I have a working REX6000 is perfect working condition. What can I do with it now? Can it sync to something like Google? I think that nowadays Rex6000 is useless. I used it for addressbook, todo list, sometimes for reading news using rex.mamy.to, but first two options are available in all phones and there is no point to duplicate it. Syncing with something no longer works – there was an application to do something silimar to rex.mamy.to but offline. I doubt that you could use some very old software and drivers in modern OSes. AFAIR installing drivers under Win98 was problematic, so on XP it could be even harder or impossible. I’m sorry, but I can’t imagine any purpose for this old device. I recall when I was a teenager I was drooling over this product when it first came out and was expensive. It somehow remained in my memory, and I was looking it up today and found your web site. It’s endearing to see there are still people using it in the age of what would have been “super PDA phones” – smart phones. 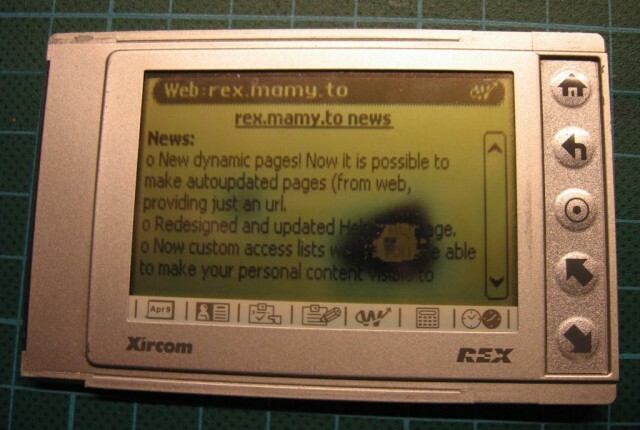 I gave you much credit for running the web site for REX, I am sure that this product lasted much longer in the hands of its users than the creating company ever imagined. I still get my Rex out occasionally… Still working. sorry to see the web synce site go. I used my Rex6000 until I became disabled and no longer worked needing a PDA daily. just about 4 years ago. I also used a Palm M512 as it offered a few more features and dif Doc and image files plus color and some souns app addons. was going to get a Blackberry to add phone/internet but now retired and dont even own a smart phone just flip phones like Samsung Rugby3. I just got my Rex and Palm out and updated batteries but the Rex lasts way longer per fresh patteries than the Palm and still has loads of info in my pocket that is difficult to sync with my phones and too much to re-enter by hand. my Rex has always been my goto reference guide at work etc when away from modern communications etc. did Citizen ever advance the Rex platform or plan to? keep me posted of any changes please Thanks! do you still have any of the old public E-books etc in text form? I would love to have some to load on my rex as memos if there are any you can email a zip of them please, Thanks again for doing such a wonderful job for all those years I had a few pages on the old site also with several members syncing to them for daily info. I still use my REX (but haven’t tried to sync it since the XP years) for storing all my passwords and some contacts. Unfortunately the memory has become full and it tells me that I can’t delete anything because I don’t have any memory space. I would like to remove all the contacts. Is there a way to do that? REX have a specific memory management. Every time you do ANY change (add, modify and even delete) on any content, contacts, calendar etc, it marks old memory location as ‘dirty’ and put data into new memory location. Because of that, If you fill up all memory, you are even unable to delete anything. But during syncing with PC there was also garbage collector run to free all ‘dirty’ pages and reclaim wasted memory. So, solution for your ‘out of memory’ problem is to make sync with PC. If you can’t use Windows98 to do it, you can try using Rextools for Linux from https://majek.sh/rextools/ as it have rexdefrag tool to do it. But beware – this software is 16 years old and I can’t guarantee that it still works. Even though the Red era could be over, I still miss playing some games on my old Rex 6000. Since mine is now broken, I’m looking for a new one to buy. Do you have/know someone that has a Rex that is looking for a new home? I’ve been looking on eBay for a while but nothing has showed up. If you know about something, please send me an email. Thanks!